A UI ophthalmologist finds a vehicle to accelerate vision research. Spectators at the Indianapolis Motor Speedway recently spotted a logo beloved by many Hawkeye fans on the legendary racetrack. The Tigerhawk adorns the race car of Elliott Sohn, a retina surgeon-scientist who uses his hobby to raise awareness for the UI's Wynn Institute for Vision Research. "Having that logo on the car and apparel just draws people in," says the UI associate ophthalmology professor, who competed last month at the 2017 Sports Car Club of America National Championship Runoffs in Indy. Dubbed the "Olympics of Amateur Auto Racing," the event allowed Sohn to sharpen the focus on the institute's work. Sohn's journey to Indianapolis began three years ago when he was introduced to racing by former UI physician Eugene Chang. In 2016, Sohn completed the Skip Barber Three-Day Racing School. 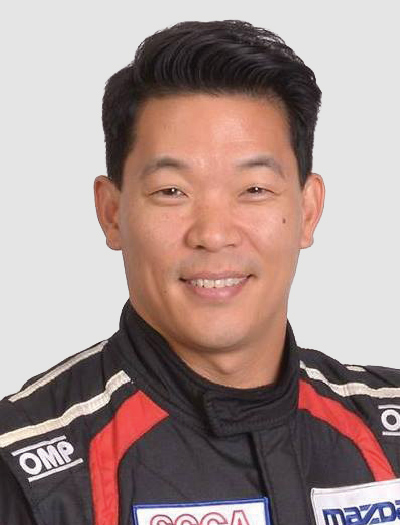 At first, he used his own street car (a Porsche 911), but with the encouragement of Indy 500 champion and UI Wynn Institute partner Buddy Lazier, Sohn competed in his first official race this past spring behind the wheel of a Formula Enterprise car. Lazier—whose daughter, Jacqueline, lost sight in her right eye due to glaucoma and a rare eye disorder—also sported the Tigerhawk logo to raise awareness of vision research during several recent Indy 500 races. Whether maneuvering the track at high speeds or delicately performing eye surgery, Sohn sees similarities between his passions. "In the operating room, you have to constantly be on your toes. At any given moment, something [unexpected] could happen," he says. "When you're on the racetrack, you're doing something very similar. You have to have complete awareness of your surroundings." To watch Sohn drive a practice lap, visit bit.ly/IndySohn. Or, visit his Facebook page at facebook.com/sohnracing.